ZTechnik's Stainless Steel Engine Guards will never rust like powdercoated steel engine guards. They are carefully designed to allow clearance for oil changes or valve cover access, so they don't need to be removed for routine maintenance. * Will not work on models with Dual Spark motors. 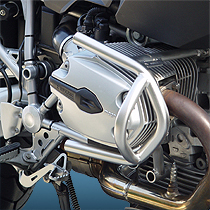 ZTechnik’s Stainless Steel Engine Guards will never rust like powdercoated steel engine guards. 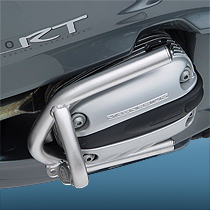 Guards attach to the engine mounts – not the engine covers – to protect the cylinder heads and not destroy them. Integrated top brackets on each guard allow the rider to mount accessory lights, video cameras, or whatever they can imagine! 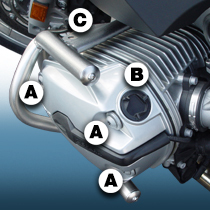 For greater comfort on longer rides, mount 1-inch (2.54cm) foot pegs to the Engine Guard’s lower section. 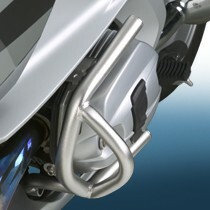 NOTE: Not compatible with ZTechnik or aftermarket exhaust headers, as they will not allow for installation of O2 sensor. NOTE: Model Z7105 will not work on models with twin spark motors. ZTechnik's Engine Guards are carefully designed to (A) allow clearance for valve cover access or (B) oil changes, so they don't need to be removed for routine maintenance. An integrated top bracket (C) on each Engine Guard allows you to mount aftermarket accessory lights, video cameras or whatever you can imagine (accessible on all but the R1200RT model). ZTechnik Engine Guards are media blasted, then electropolished for a textured matte finish.